Forms part of Fonds 1. 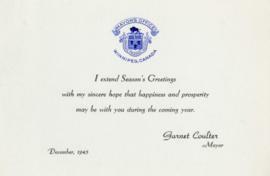 Series consists of correspondence files from the Mayor's office for the years 1912-1971. Subject matters range from city services, city committees and departments, and matters relating to governance of the city, to cultural activities and groups, sporting events, animals, and a number of other subjects. Access to files less than 100 years old containing personal information may be restricted. A preliminary inventory list is available in the Archives Research Room. Consult with an Archivist for further assistance. Records are kept off site, and retrieval requests will require 3-5 business days.